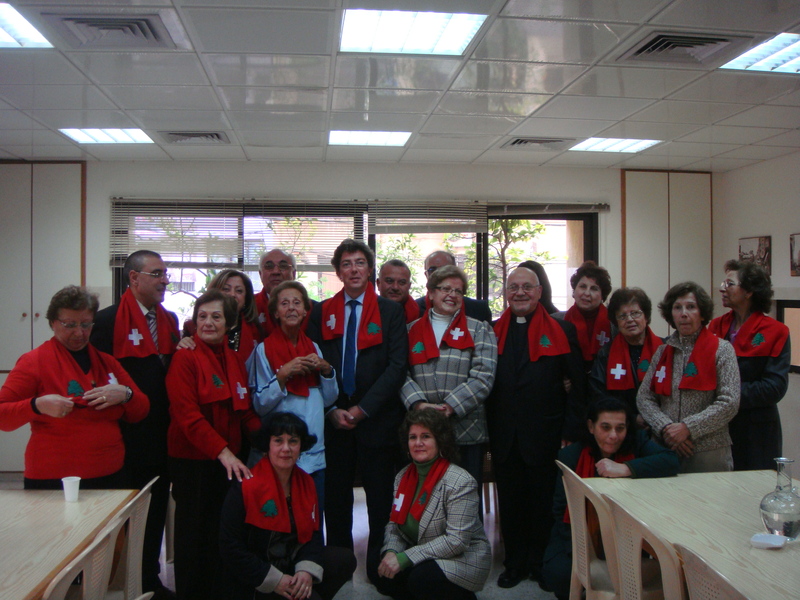 Souvenir scarfs were distributed to the elderly by Mr. Hatem and Mr. Richard as a symbol of friendship between the Swiss and Lebanese communities. The new Board of Directors of the Swiss Business Council-Lebanon embarked its social program by organizing a luncheon in honor of the elderly brothers of the region of Furn El Chebbak and neighborhood, in presence of Mr. Boris Richard, representing Her Excellency Mrs. Flint, Ambassador of Switzerland in Lebnaon, Dr. Khalil Sasi, representing the President of the Municipality of Furn El Chebbak & Dr. Nicolas Hajjar, President of Centre Darouna. Mr. Habib Hatem, President of the SBC-L took the opportunity to express that this symbolic gesture which is reflected in a division of the bread is a deep union that we wish to consolidate between different generations or culture or social class. Furthermore, the presence of Mr. Richard as a personal representative of the Swiss Embassy in Lebanon and Her Excellency Ambassador Ruth Flint, reminds us of the spirit of cooperation that Swiss organizations around the world continue to spread. He added saying that we would like Lebanon, Switzerland of the Middle East, to continue being the country of understanding, respecting each other and accepting our multiple cultures. Mr. Hatem then gave the word to Mr. Richard who on behalf of Her Excellency Mrs. Flint congratulated the center Darouna for their continuous devotion and their hard work and encouraged the SBC-L to continue organizing such social events and setting an example and spreading the Swiss spirit.